Louisville High School Focus Program Goes Behind the Scenes at the Zoo! 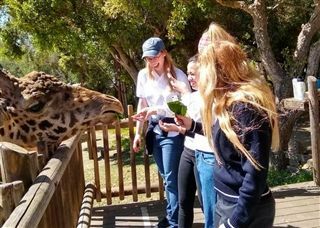 The girls went behind the scenes and were able to visit the enclosures of the gorillas, giraffes, and penguins. Ellie and the whole zookeeper team were nice enough to involve them when something cool happened. Jessica Bereny ’20 and Natalie Duda ’19 agreed, “Ellie was so professional and nice to us and she planned such a full day for us. We got to “walk” the flamingos, feed the giraffes, and really see what it’s like to work at a zoo. It also gave us a new perspective of what zoos are all about and their purpose in our world. 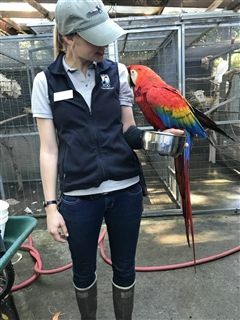 Caitlin McNeal ’20 adds, “My favorite part of the day was when we got to be close to the animals and to see what it takes to work at a zoo, especially to see the things behind the scenes that the public does not get to see. Thank you Ellie and all of our talented alumnae and parents who support our students in the Focus Program.